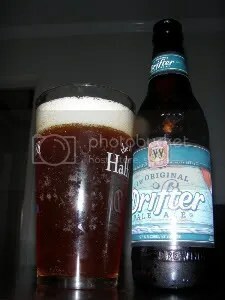 The “Original” Drifter Pale Ale is another fine brew from the folks over at Widmer Brothers Brewing Company. Drifter is an American Pale Ale with 32 IBU’s and a 5.7% ABV. With its unique citrus character, smooth drinkability, and distinctive hop character, Drifter Pale Ale is truly an original. Brewed with generous amounts of Summit hops, a variety known for their intense citrus flavors and aromas, Drifter has a taste unique to the Pale Ale category. True to style, the bittering hops are perceptible enough to give the beer a crisp, clean, quenching finish, yet also soft enough to keep the beer smooth and balanced. Without even lifting the bottle to my nose the smell of pine floods from the brew. Equally as prevalent are hints of lime, citrus, and even mild floral scents. Very similar to the nose of an American IPA. The beer pours with an enticing slight amber color. Almost like a nice glass of iced tea. The head is one (big) finger of white foam that fades to a slight film with minor lacing. Drifter is a fantastic APA! The hops come through tremendously in the taste, flooding the palette with piney goodness. Just what you would expect from this style of beer (that’s a good thing). Even though it’s not a particularly high alcohol brew, a warmth is prevalent in the mouthfeel. Leaving little bite or dryness after the finish. As it warms up a Belgian sugar-like sweetness makes its self apparent in both smell and taste. I want more of this beer! The Original Drifter Pale Ale is another winner from Widmer Brothers. It’s a fantastic beer to have at a summertime cookout or just while sitting around watching sports (like I’m doing!). Drifter is definitely going to become my go to APA from this point on.